Parents are expected to give their children an average of £17,500 this year to help them get on the property ladder, according to Legal & General (L&G) data. 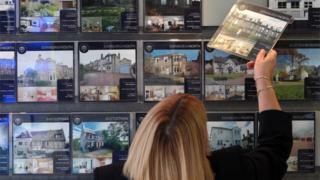 The so-called Bank of Mum and Dad will be at least part-funding a quarter of all UK mortgages, the data suggests. We asked just how Mum and Dad found the money and whether they're happy to hand it over. Alexandra is selling her five-bedroom home in Dinnington, near Newcastle, to help her son and his girlfriend buy their first house. James, 23, works in telesales for a mobile phone company and his take-home pay is almost entirely dependent on bonuses. He has been living in the family home, with his girlfriend staying over most nights. Alexandra plans to give him £10,000 towards a semi-detached two-bedroom house in Fenham, close to the family home. Alexandra will downsize to a three-bedroom semi-detached in a "not-quite-so-nice area," to free up the money. She's planning to put another £10,000 into a trust fund for her daughter, Nicola, currently a student, so she can do the same for her when she wants to buy a house. Alexandra believes young people aren't given enough help and has come up with her own solution - first-time buyers should never be charged more than a 2% interest rate on their mortgage for the first five years. "House prices are outrageous," she told the BBC News. "However, mortgage repayments are still less than rental payments and at least having a mortgage gives the kids an investment rather than throwing their hard-earned money away with no return." Gillian and her husband have helped all six of their children buy homes over the years. They describe themselves as comfortable, but not well-off, and now live in a mortgage-free semi-detached house by the sea in north-east England. She believes their situation has benefited from living where house prices remain "reasonable" in relation to wages. Their own mortgage was paid off and their parents had passed on their estates before the children were at an age when they wanted to set up home. Gillian says all six (their two and her four step-children) are in employment, some in more precarious work than others, earning enough to pay a mortgage but not enough to pay rent and save for a deposit without help. Her youngest daughter lived in a caravan on a farm she was working on for 18 months before Gillian and her husband were in a position to help her buy a cottage. Her youngest son, in the restaurant industry, and his girlfriend returned to the family home for two years after graduation while finding jobs and saving. They are now buying a three-bedroom house. The help came from a combination of Gillian's "retirement lump sum" and proceeds from shares in her parents' and her in-laws' estates. "I consider every penny given to the children to be money well spent: all these inherited assets, each one not especially large, would have earned nothing in interest over the past seven or eight years, but as a leg-up for the children, their value has been priceless, and absolutely what their grandparents would have wanted done with the money," she told BBC News. "I realise not everyone is in a position to be able to help six young people and their partners as we have done - but we feel we have acted as responsible stewards of modest family assets." Rob is Tessa Honey's only son, and when he grew increasingly frustrated about still living at home at 32, she offered to help. Rob was working for the NHS, had savings and a girlfriend with a regular job, yet they could not get on the housing ladder. Tessa offered to double his deposit of £25,000 and Rob finally found a property just outside Rochester in Kent that he liked. The place was on the market for less than 24 hours for £195,000. The owner had four offers at £10,000 over the asking price within that period and only agreed to sell to Rob at £204,000 because he was a first-time buyer. "I bought a virtually identical property in 1979 for £11,000," she told BBC News. Tessa, who now lives alone in a "great big house" in south London, said it seemed sensible to give her only son some of what he would eventually inherit. "I've very fortunate to be able to help, and I think my son appreciates this."